Tributes have been paid to two teenagers who died after falling into a canal. Sara Rylance, 17, and Fayz Uddin, 18, were pulled unconscious from Smethwick Locks in the West Midlands on Wednesday evening. Police are investigating the circumstances surrounding the incident but believe it to be a "tragic accident". Fayz's uncle, Nasir Uddin, said he was a "nice, caring young man". Floral tributes were left at the scene on Thursday. A card on one bouquet read: "To Sara RIP. God Bless. Love Aunty Jean, Uncle Rody, Vicky, Kay and Lisa." The spot where the incident took place is where young people sometimes gather. Mr Uddin said his nephew wanted to go out briefly on Wednesday evening. "He just wanted to go out for five minutes," he added. "I wasn't even around... he just wanted five minutes and that five minutes was the last moments of his life. "It's a loss for the family and first and foremost for his parents." Fayz studied Business and IT at Halesowen College last year and a spokesperson said students would be supported. "We extend our deepest sympathies to both families. "Measures will be put in place to ensure students are supported." West Midlands Ambulance Service was called to the towpath, near Brasshouse Lane in Smethwick, at about 19:20 BST on Wednesday after a report that two people had fallen into the water. Firefighters arrived at the scene within six minutes and reached the pair in the water. Sara was towed along the lock to some steps and a firefighter entered the water to reach Fayz, West Midlands Fire Service said. They were taken to hospital but pronounced dead after resuscitation attempts. Jayne Silvester, who lives close to the canal, said: "[Fire crews] brought the first person up and the officer was still trying to resuscitate them. "The paramedics were still trying to resuscitate them and then what seemed like about 10 minutes later, I can't tell you exactly the times because it was so distressing, then they were working on the other person involved... and they were resuscitating as they were going." 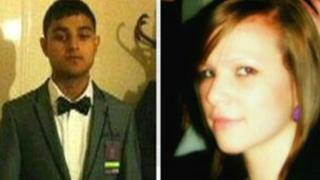 Confirming the identities of the two teenager, West Midlands Police said officers were investigating the deaths. The families were being supported by family liaison officers, they added. The fire service urged people to take care by unprotected stretches of water. "There are no safety barriers and the edges are quite slippy and should you fall in, the temperature under water at this time of year will take its toll on the human body quite quickly," a spokesman said. A spokesman for British Waterways, which manages the canal, repeated that warning. "Obviously we don't know the circumstances surrounding this incident and our thoughts go out to the families of the young people involved. "Our general advice to people using the waterways is to stay away from the water's edge at all times."